At last year’s Google I/O, Google Wave was introduced to the word. At the time, it was strictly a preview for developers, but three months ago Google allowed the public to be a part of the Wave community. 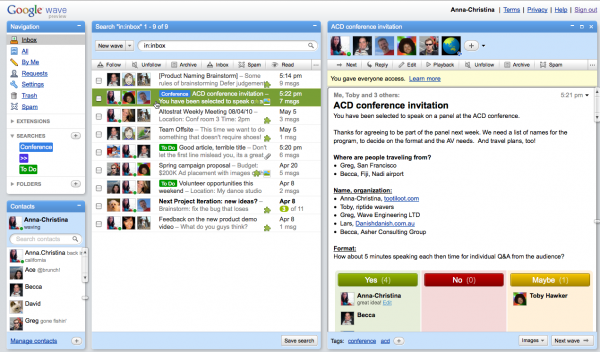 Google Wave was ideal for users because of its ability to relay real time communication and collaboration. Moreover, Wave had features like drag-and-drop files and easy viewing of the history of changes. 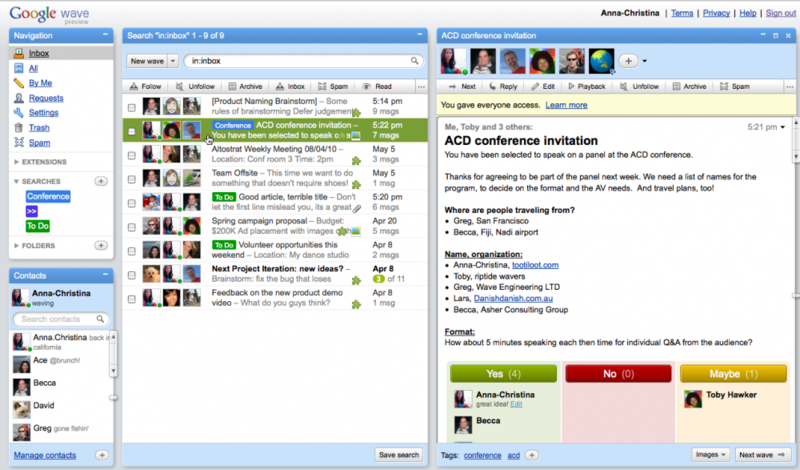 This made Wave an ideal application for digital meetings. A year ago, the developers at Google I/O cheered to be a part of the next Wave in Google development. Three months ago, the intelligent tech consumer quickly jumped on the Wave wagon to find out just how well the features would work. Unfortunately, the adoption of Google Wave “has not seen the user adoption [Google] would have liked,” and according to the Google blog, sadly, Wave development is now finished. Google Wave presented some revolutionary ideas in terms of web communication and conferencing. Although Google has no plans to continue development for Wave, Urs Hölzle, Senior Vice President, Operations & Google Fellow wrote, “the central parts of the code, as well as the protocols that have driven many of Wave’s innovation…are already available as open source, so customers and partners can continue the innovation we began”. Therefore, even though Wave will be sitting on the sidelines for the foreseeable future, Google still believes in the product they made even if the wide majority of users never fully supported Wave in the first place. Moreover, it’s really a no brainer why people didn’t adopt Wave when tools like Google Talk work extraordinarily well. Users tend to stick with things that works well, and few make the switch to another service, even if it is technically better. On top of that, most people don’t need to see live character-by-character display so most just stuck with what they knew. Even though Wave will reach its end a bit prematurely, many of the communication breakthroughs it ushered in will not be forgotten. In fact, I would go so far as to say that we could see character-by-character display, full history, and drag-and-drop files in Google Talk in the very near future. On the plus side, with the development team shifting gears away from Google Wave, the minds at Google can now focus their time on creating another innovative application.